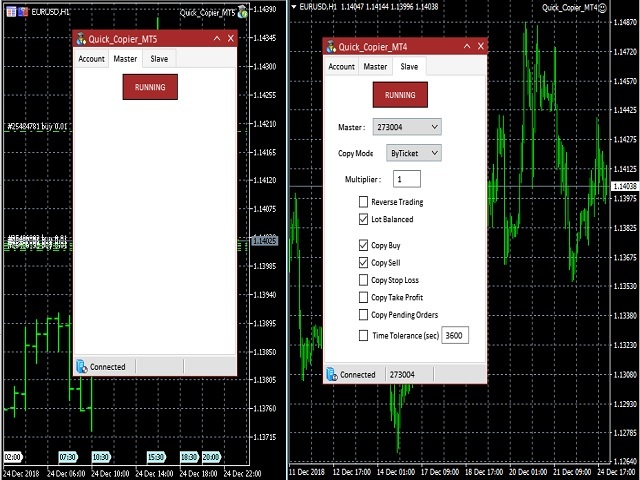 "Quick Copier" is designed to copy trading without any complicated settings. It copies master orders faster than "Just Copier" (https://www.mql5.com/en/market/product/20920). The copy can be done in one PC. If you want to copy MT4 -> MT5 or MT5 -> MT4, please purchase "Quick Copier MT4" and "Quick Copier MT5" separately. Quick Copier can copies Pending Orders, Stoploss and Takeprofit. In one terminal, "Quick Copier" can be functioning as a Master and at the same time also as a Slave. So that Quick Copier can be used as a tool to copy trading as a Slave and then immediately send trading signals as a Master. Just bought it, review later.